Probably all would agree that everything what is made by HBO is a relief for the tired eyes and numbed brains. There is no doubt that “True Detective” is one of the most anticipated TV series this year. It is, actually, the most intriguing TV production. Police detectives in Louisiana Rust Cohl (Matthew McConaughey) and Martin Hart (Woody Harrelson) get an unprecedented case of a brutal ritual murder. The young prostitute is murdered. Some symbol is drawn on her body and the crown made of horns is put on her head. Pessimist and always lost in his thoughts Rust is certain that this girl is not the first victim of the serial killer. So the investigation starts and reveals new as well as unexpected details. The first season is about seventeen years of investigation. You can see the present and detectives’ recollections which helps you to see the details and a total view of how detectives have changed and how the story has developed. From the first minute we realise that McConaughey’s character changed significantly –he drinks alcohol in the middle of a day. His hair is matted and clothes are dirty. That helps to realise that his detective career was not so successful. We do not know why characters’ lives turned upside down. Who made a committed but pessimist detective quit his job and start to live like this? It seems that the creators of this series have enough time to clarify everything but it is not so easy to tell all life stories during eight episodes. “True detective” is developed as an anthology. According to creators, each season begins with the new story and actors, so we will not be able to enjoy Matthew McConaughey and Woody Harrelson’s acting after the first season ends. Nic Pizzolatto, the creator and the author of scenario, depicted all episodes of the first season. He was not well-known before although he released a quite popular book “Galveston” and wrote a scenario for two episodes of “The Killing”. This man grew up in a remote area of Louisiana, far away from the nearest city Pizzolatto. 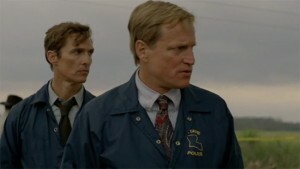 It is not surprising that “True Detective” takes place in Louisiana. However, there are many TV series about serial killers starting from the well-known “Dexter” and ending with “Hannibal” or “The Following” so why this one is so special? Why is it worth our time? The answer is – the most impressive and perfect performances of Matthew McConaughey and Woody Harrelson. The series starts slowly introducing its format, style and an impressive crowd of actors. Matthew McConaughey who started his career in such comedies like “The Wedding Planner“ or “How to lose a guy in 10 days” is presenting more memorable roles where he opens out as a talented and gifted actor in “Dirt”, “The Lincoln Lawyer“ or one of the masterpieces “Dallas Buyers Club”. He had to lose 14 kilos just because of this role. Matthew is hardly recognisable in “True Detective” and that makes his sociopath detective more attractive. Even though McConaughey occupies all the attention, his colleague Woody Harrelson is not behind with his own performance. Harrelson’s career started when he appeared in a movie “People vs. Larry Flynt”. After that came another successful movie “The Thin Red Line”, “No Country for Old Men” and many more. At first sight, Woody acts like a decent policeman. He is successfully married, honest officer who is loved by the colleagues. It later becomes clear that there is no reason to believe in stereotypes. You will see more characters in this series like Martin’s wife Maggie (Michelle Monaghan) who makes a morose Rustin to speak out. Also, detectives (Michael Potts, Tory Kittles) working in the police department who talk to Hart and Cohl about murders that happened 17 years ago. Cary Joji Fukunaga is the director of the series. He also directed developed “Jane Eyre” in 2011. Dark and mysterious atmosphere which compels viewers’ attention from the very first minute is created by making great and creative decisions, time springs and perfect dialogues which were written by Nic Pizzolatto. At first, series seems to be slow and turning upon the life of two characters but after the third episode the action which interests the audience starts. The sound track which was created by T. Bone Burnett, a very talented and awarded man, perfectly fits the dark and intriguing series. Actually, the series is very compelling and interesting. At first it seems to be slow but action takes place soon enough. Great Matthew McConaughey and Woody Harrelson‘s performance does not leave any doubt about the geniality of their acting. A harmonious work of Cario Joji Fukunag, the director, and Nico Pizzolatto, the scenario author, creates an atmosphere full of darkness and mystery.